This is where you will find links to other artists pages, social-media groups, and websites! This page was set up to support local and independent artists from around the world. If you would like to be featured on this page you can apply by sending a message including the following information. The best of which will then appear here! Emails should be sent to mark@beechhousemedia.co.uk and MUST include the subject header Artist Spotlight Feature. I will then feature the best entries in a future Artists Spotlight blog post, and will also promote some of the best on my social-media accounts on Facebook and Twitter. You will also appear on my upcoming Artists Spotlight page. There is no charge for this at all but you are welcome to donate the cost of a cup of coffee through my Go Fund Me site. Whilst I cannot guarantee that you will get hundreds (or any!) sales, it will give you another outlet where you can promote your work. If you do get lots of new sales, you can always buy me a coffee, just beware, I do not drink instant coffee at all and I can tell the difference between real coffee and instant at 50 paces! Occasionally I get an email or message from Joshua, always full of wit, and always with a brand new idea. Just how someone can have so many consecutively great ideas is beyond me, but have them he does and I expect that we will see his site, group, and channel grow significantly over the next year, because he works hard, clearly has a passion for the arts, and is genuinely a great guy. A new section on his site connects the creative community with each other and the rest of the world. Musicians and bands can share sound cloud links, artists can share their artwork, and performing artists can share video and well as upcoming events. If a band or musician needs an album cover, this is where you can come to get it commissioned, and if an artist needs a song for a promotional video, they’re covered too. The group is local, so supports local and independent artists which regular readers of this blog will know that I am passionate about. Tina Anns is a specialist who creates hand stamped jewellery and each item is an artwork in itself. Her work is timeless yet has a modern vibe that creates a marriage of form and material. I have known both Tina and her husband Lewis for a number of years, and they are two of the most wonderful people you could wish to meet. 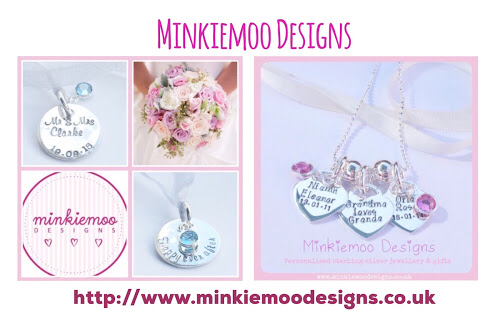 Tina is the owner of Minkiemoo Designs and creates beautiful personalised sterling silver jewellery which is at the very heart of what she creates. What’s more, her designs can usually be adapted to suit personal preference. Tina also has a range of giftware, ladies personalised bracelets, ladies personalised necklaces, personalised accessories, and wedding bouquet charms. The gentlemen are also catered for with a stunning range of men’s personalised jewellery. Tina’s work is inexpensive for such quality items. Her Wish bracelets make wonderful stocking fillers and gifts for teachers. They are all handmade and prices start from around £8.95 plus postage and packaging. My advice if you wish to order any of Tina’s work is to get in quickly. Very often she is inundated with orders and becomes especially busy on the lead up to Christmas. I have known Shelley for a while, but I have known of her work for much longer. She is a truly talented water color artist and her works show more than an awareness of the beauty of the everyday in an extraordinary display of talent. Her work is vibrant and fun, and often produces and multidimensional space where a variety of thoughts and ideas coexist. Her works exemplify the mediums expressive potential to produce consistent works. There is never a doubt that the work you are looking at is a Shelley Wallace Ylst creation. I see the work on my timeline and immediately, the colors pop, the lines are consistently drawn, impressively executed and you feel a sense of ease and overwhelming joy when viewing the work. It really is that good. Shelley told me that: “I fell in love with watercolors in high school, studied at the University of Utah and have been painting ever since. I love the spontaneity and transparency of watercolors and I paint in vivid, rich colors. My art is always evolving and full of joy”. I quite often notice when perusing social media that her style is often mimicked, but the color never pops as it does on a work from Shelley, nor do those who attempt her unique style portray anywhere near the same sense of quality, care, and joy. 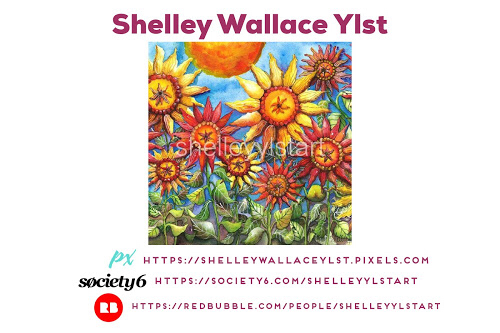 Shelley Wallace Ylst is certainly a name to look out for, and I would advise buying her work immediately. I do not say this lightly at all, I have seen some impressive work in galleries around the world, this is certainly on a par, and then some. Another artist friend who has exhibited widely and won a number of awards for her work is Caroline Evans Coles. What can I say? Caroline’s work often leaves you open mouthed and her work demonstrates the intense emotion and passion of the artist herself. There is always an intricate weaving of elements in any of her works, creating a marriage of form and material. Caroline’s artwork is exceptional and glorifies the beauty of nature, both fauna and flora, and continuously evolves. The release of each new work is always something that one looks forward to, portraying real and raw world and human issues through narrative illustration, colour and strong imagery/symbolism, bringing visual delight without detracting from her message. Caroline views life through color and this is evident throughout. Her works are always consistent, and much like Shelley Wallace Ylst, her works are instantly recognizable. Caroline also feels deeply about quite a few issues, not least the destruction we are wreaking upon our beautiful planet and the appalling cruelty that is inflicted daily on defenceless animals. This is why a percentage of proceeds made on her Wildlife pieces is given to various animal welfare charities, with which she is involved. She has also donated some of her artwork for auction to help raise funds and awareness for these organisations. Caroline says “Apart from my ‘realistic’ paintings, most of my artwork is pure fantasy and created not only for the simple enjoyment of being able to use my imagination, but also to hopefully encourage others to use theirs – through vibrant colour and visual stimulation. My more intricate creations encompass a lot of hidden elements, all of which can be interpreted differently depending on the viewer”. No relation, but you really DO need to see Colleen’s work, in fact you may already will have done because she is known primarily for her extensive years as a prolific large format wall mural artist within Colorado and the Rocky Mountain regions. An internationally renowned artist who is also a rare blend of both artist and entrepreneurial business person. Her clients range from range from professional athletes, Beringer Vineyards, Warner Bros, The Denver Broncos Organization, Colorado Rockies Baseball & many professional builders. She has been featured and published in Denver Design Resources, the Parade of Homes, and many other publications throughout Colorado and the surrounding Rocky Mountains. Colleen has an exceptional attention to detail and depth of field. She has mastered the art of creating unique, elegant and stunning paintings from sources within her life. Her unique approach is to become deeply absorbed in the complexity and challenge of her paintings. Combining organic traditional paints with the latest technological advances in the fine art field makes her paintings one-of-a-kind works of art. Colleen is an Image Licensed as well as a Rights-Managed license artist with Licensing.Pixels.com. Colleen covers a myriad of subject matter. In reality it is not so much about the subject as the challenge of portraying the interplay of light and dark, the rhythm of shapes and the excitement of color, the mood and atmosphere. 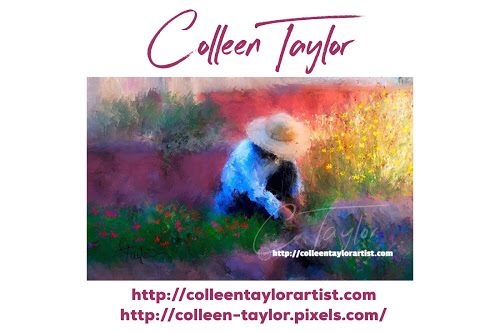 Whether it is a portrait of a loved one, a field of sunflowers, a precious pet, a child being chased by the waves of the vast sea, or a tender moment shared within a family, Colleen will capture the essence of the moment in an original painting that will be treasured forever. Colleen’s work always show an energy that is all too often missing from the works of many fine and contemporary artists today. Her paintings are skillfully and meticulously created, revealing influences of some of the great masters, and show a remarkable understanding of technique. To own her work is a privilege amongst discerning collectors, of which she has many.